This post is #sponsored by Milo’s Kitchen®. I received product and compensation, but all opinions are my own and always will be! Thanks for supporting content that keeps Jojotastic going. When people find out that I have two wiener dogs, they automatically assume that I adopted them both in an effort to assemble a whole pack of dachshunds. 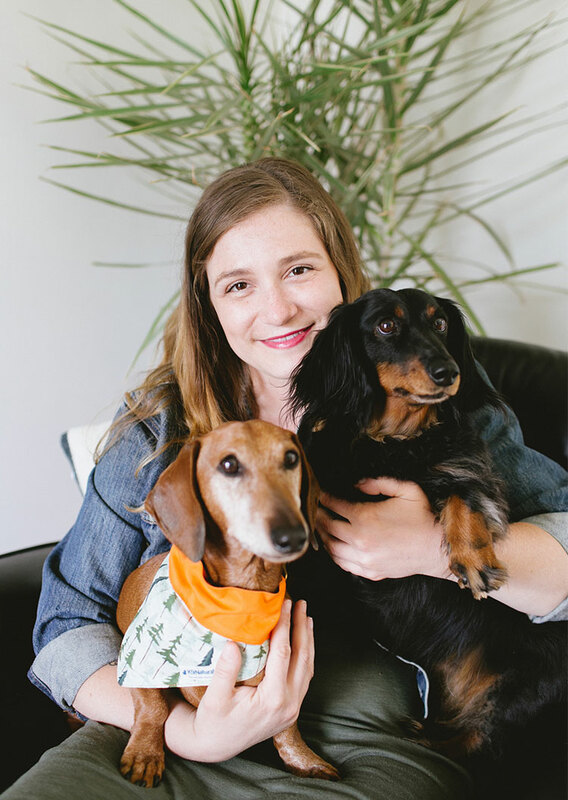 But the real story goes something like this: girl with wiener dog meets boy with wiener dog. They fall in love and blend their dog family into a sort of Brady Bunch situation — but with more barking and tail wagging. All joking aside, when I met Lucy, we connected immediately, thanks in part to my habit of bonding with her by offeringtreats whenever she came over with Sean. Now that we all live together in one beautiful swirl of small space living and dog hair, I love to spoil both of my pups with delicious, premium dog treats. My favorites? Treats that are kitchen-inspired! Last week I shared this super-cute DIY terrazzo treat jar filled with Milo’s Kitchen® chicken jerky — Noodle and Lucy love them because they’re made with real chicken as the number one ingredient so they’re rich in protein — and this week I set myself the task of finding the perfect way to keep the treats at hand while incorporating the jar into my existing decor. After putting our heads together, the wiener dogs and I came up with this cool little dog treat station complete with a marble finish and a hook to keep their leashes nicely organized and ready for their daily walks. 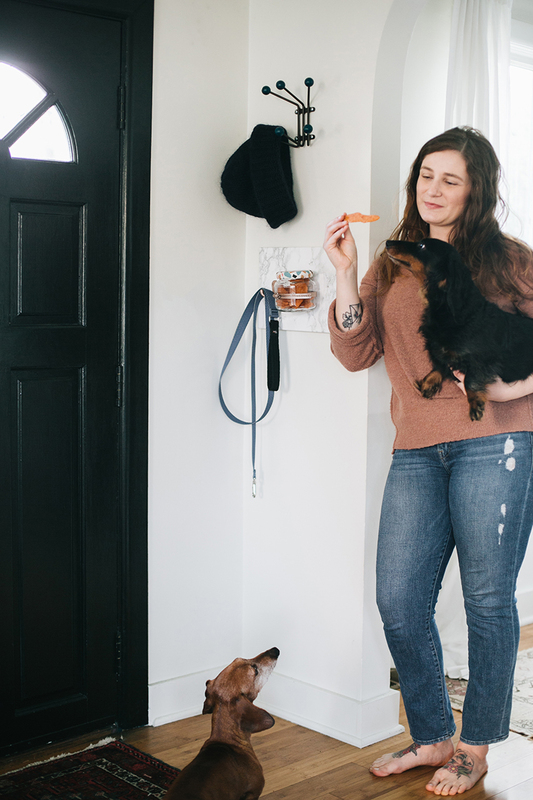 It’s the perfect thing to keep right outside your kitchen so you can treat your dogs while you’re whipping up a delicious snack to create a shared love of the kitchen with your furry four legged friends. We have a name for my house around these parts, and it’s The McBrawley Home for Wayward Wiener Dogs. Along with our two chickens and one majestic cat, Sean and I are constantly wrangling our two dachshunds: Noodle and Lucy. And we wouldn’t have it any other way. Sometimes they bark at the UPS man or chase the chickens around the yard and whatnot, but other times I’ll catch them curled up together on the couch or posing for pictures perfectly (ahem, I’m looking at you Lucy) and my heart just melts. Those are the moments that I love to treat them to something delicious. 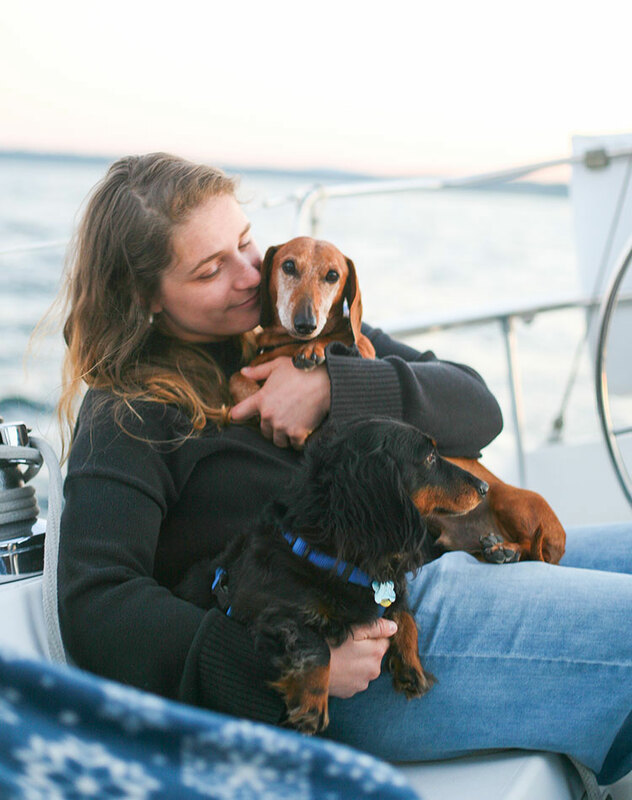 Just like my yia yia still to this day makes me her signature Greek soup recipe when I’m home and in need of something extra special and crave worthy, I like to treat my two pups to something that’s premium, hearty and made with love. 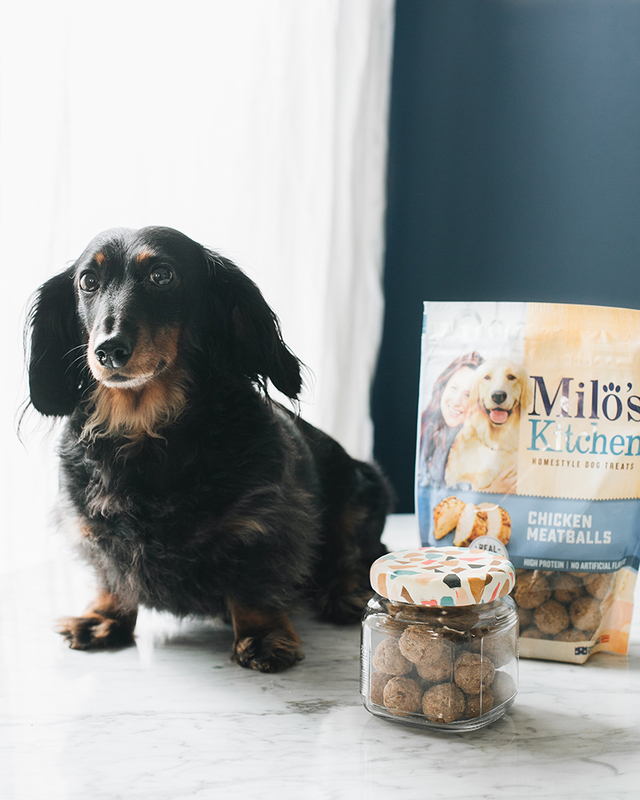 Kitchen-inspired Milo’s Kitchen® dog treats are made with real chicken as the number one ingredient, they’re high in protein and free of artificial flavors —you better believe these wiener dogs went crazy for them! But I wanted to help share our love of the kitchen and take the #TreatingTuesday experience to the next level, so I decided to dress up a simple mason jar in which to store some delicious chicken meatball treats in a way that blends perfectly with my kitchen decor and is pretty enough to keep on the counter. It’s a great way to take treating and bonding in the kitchen to a new, DIY level. Giving Noodle and Lucy treats is one of my favorite things to do – it makes all of us happy. I especially love to treat them in the kitchen, which is the heart of our home and where memories are made. This post is sponsored by K9 Natural. All opinions are my own and always will be! Thanks for supporting content that keeps Jojotastic going. Ever since I got home from my accident and figured out how to get back into the pace of day-to-day life, I’ve noticed one resounding theme: a deep and true appreciation for the simple things in life. The truth is that this injury truly shook me to my core and has now encouraged me to re-evaluate everything. Partially this introspection is due to how hard it is for me to do physical things, but also because of the sheer emotion involved in healing. I’m choosing to remain positive though, which essentially means that I am all about enjoying life’s little moments these days. One moment that immediately comes to mind is the day I got home from the hospital and was reunited with our dogs! Today I partnered with K9 Natural to share that story, plus how I’m enriching the dogs’ meals to keep them happy and healthy. This post is sponsored by Fancy Feast and Brit + Co. All opinions are my own and always will be! Thanks for supporting content that keeps Jojotastic going. Last month was seriously such a whirlwind for me that I didn’t get a chance to share a few of the exciting partnerships and projects I worked on. One of my favorites was co-hosting a DIY event in the Brit + Co Holiday House in San Francisco with Fancy Feast! We gather with over 100 cat lovers to celebrate entertaining and ways you can delight both guests and your kitties during the holidays. 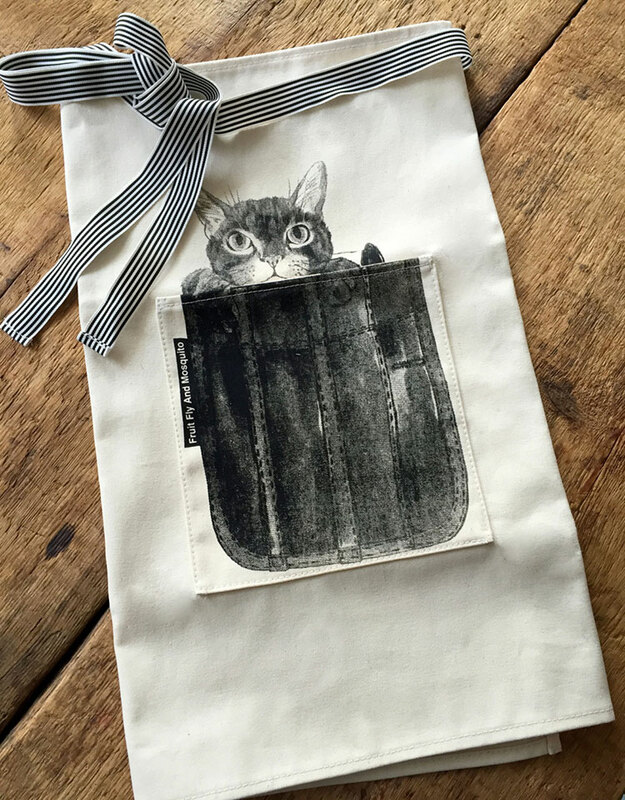 7 Fantastic Handmade Gifts for Feline Loving Friends + Join the Feastivities! Gift guide season is upon us! And, to start, I want to kick things off with one of my favorite themes of all: the perfect gift for inspired holiday entertaining for the cat loving hostess in your life (cuz we all know at least one, amiright?). This is a category near and dear to my heart, especially as a card carrying member of the cat lady club and someone who loves to entertain. 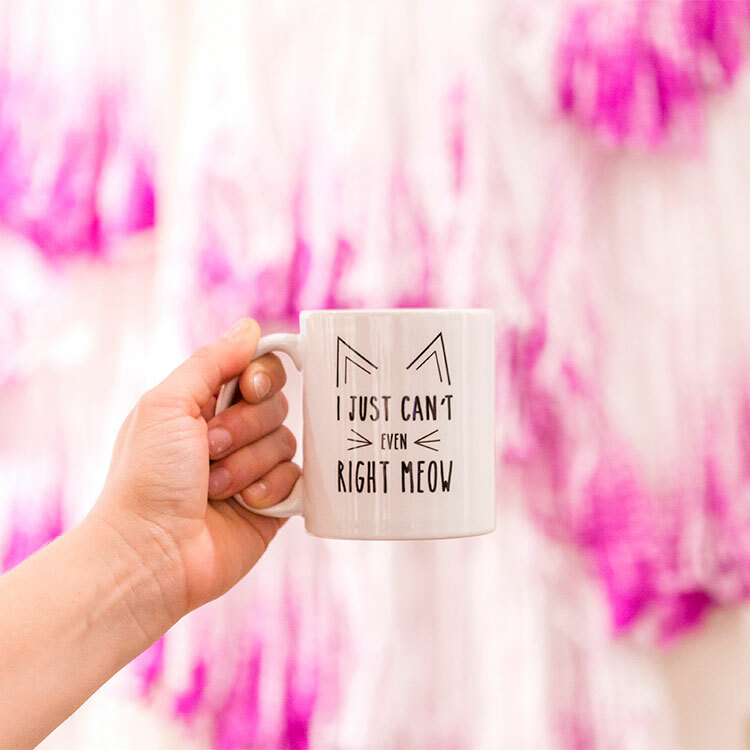 Today, I partnered with Fancy Feast and Brit + Co to share my favorite gifts under $50 that will have the cat lady in your life feeling inspired and jumping for joy + the details of the yearly Feastivities. I promise to keep the cat puns to a minimum… maybe.